Immediately pour toffee onto ungreased large cookie sheet. If necessary, quickly spread mixture to 1/4-inch thickness. Sprinkle with chocolate chips; let stand about 1 minute or until chips are completely softened. 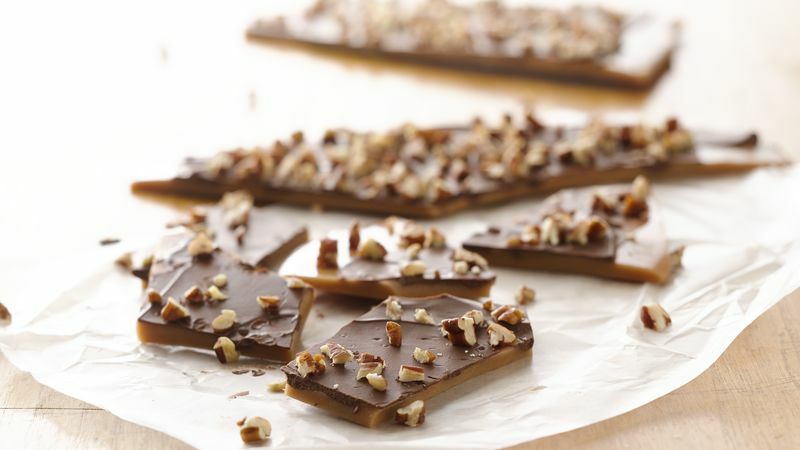 Spread softened chocolate evenly over toffee. Sprinkle with pecans. Let stand at room temperature about 1 hour, or refrigerate if desired, until firm. Break into bite-size pieces. Store in airtight container. For gift giving, fill decorative tins with Toffee, separating layers with colored plastic wrap, colored tissue paper or waxed paper. When making Toffee, a long spatula with a narrow metal blade is a good tool to have close by. You’ll use it to both spread the toffee and the melted chocolate chips quickly and easily.